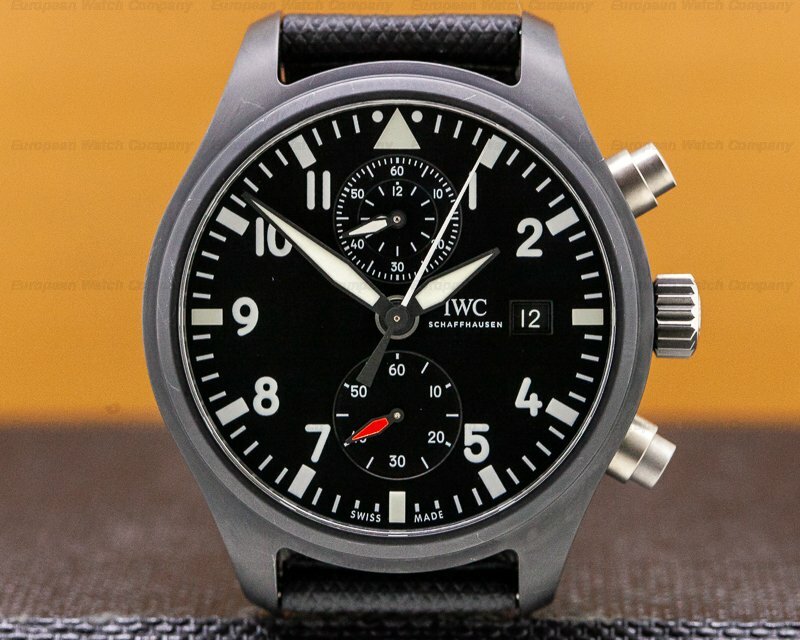 30052 IWC 3789 TOP GUN Chronograph 3789-01 378901, ceramic case on a strap with a stainless steel tang buckle, automatic IWC caliber 79320 movement, black dial with luminous Arabic numeral hour markers, luminous hands, date, day, 12-hour chronograph, small seconds at 9 o'clock, diameter: 44mm, thickness: 18mm, water resistant to 60 meters, sapphire crystal, Like New with Box and Papers; dated 2/2009. 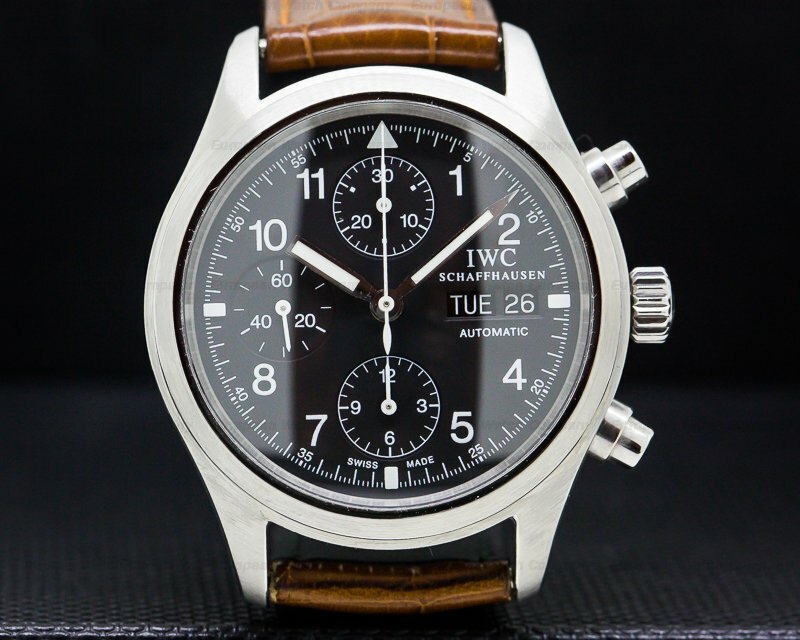 This is a high-tech ceramic/titanium IWC TOP GUN Chronograph IW378901. 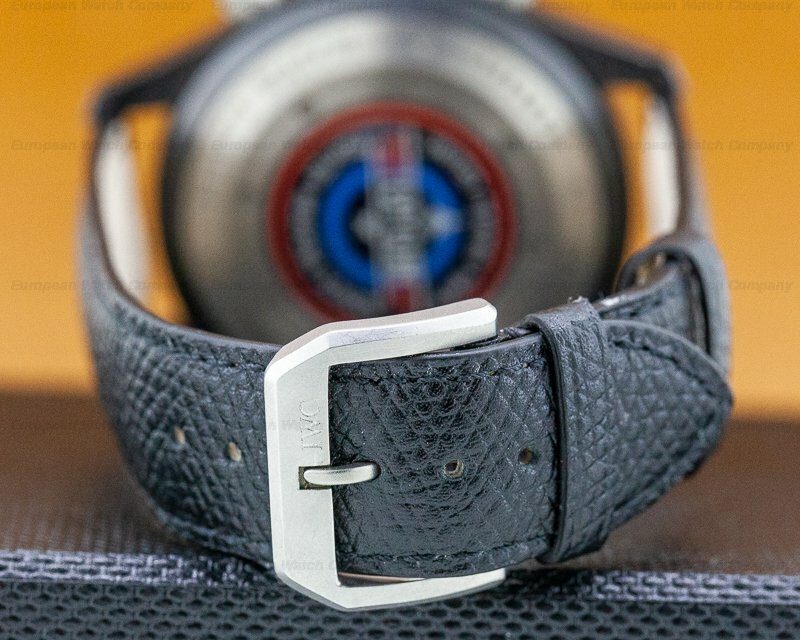 It has a leather strap with a titanium tang buckle, and a scratch resistant sapphire crystal with anti-reflective coating. 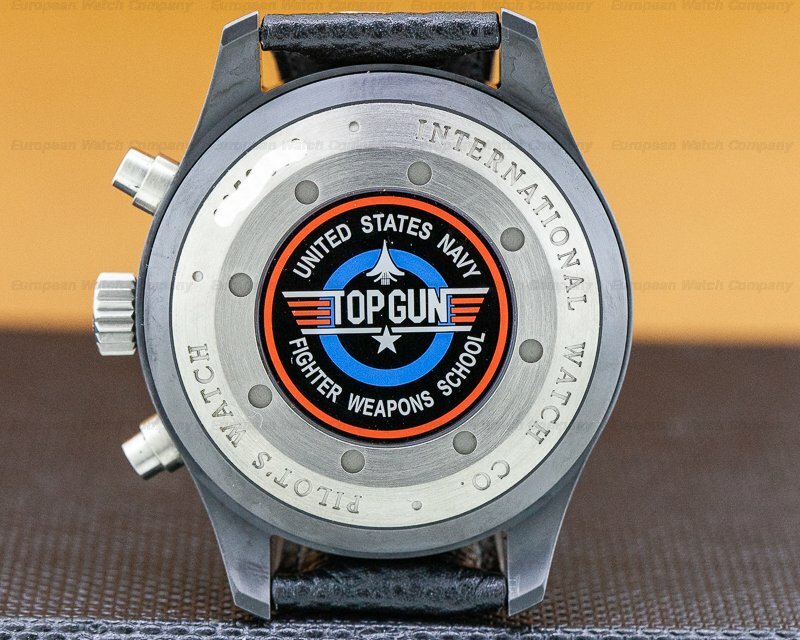 It has round plunger-type chronograph push buttons, a screw-down winding crown, and there is a screw down solid case back engraved with "INTERNATIONAL WATCH CO. – PILOT'S WATCH," and a serial number; in the center is a 4-color medallion that says "UNITED STATES NAVY – TOP GUN – FIGHTER WEAPONS SCHOOL." 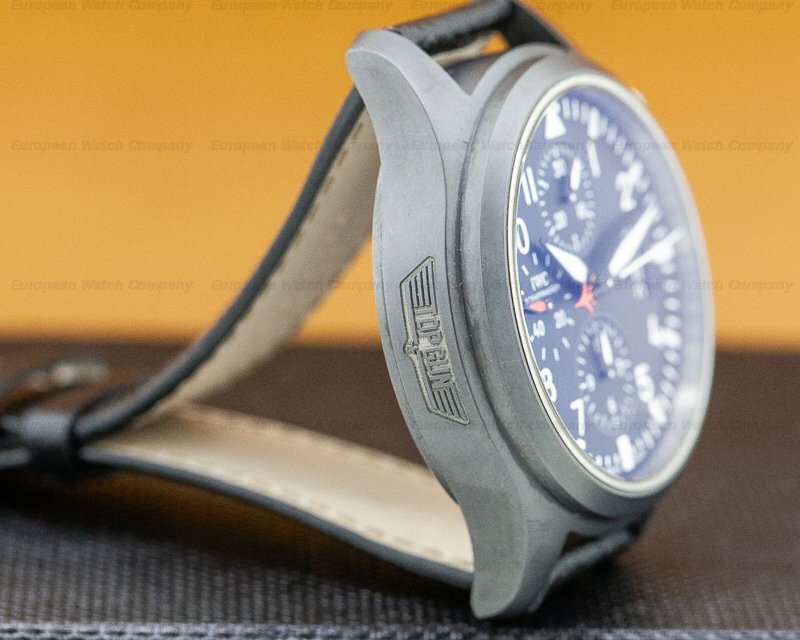 The TOP GUN insignia winds are embossed on the left side case band as well. 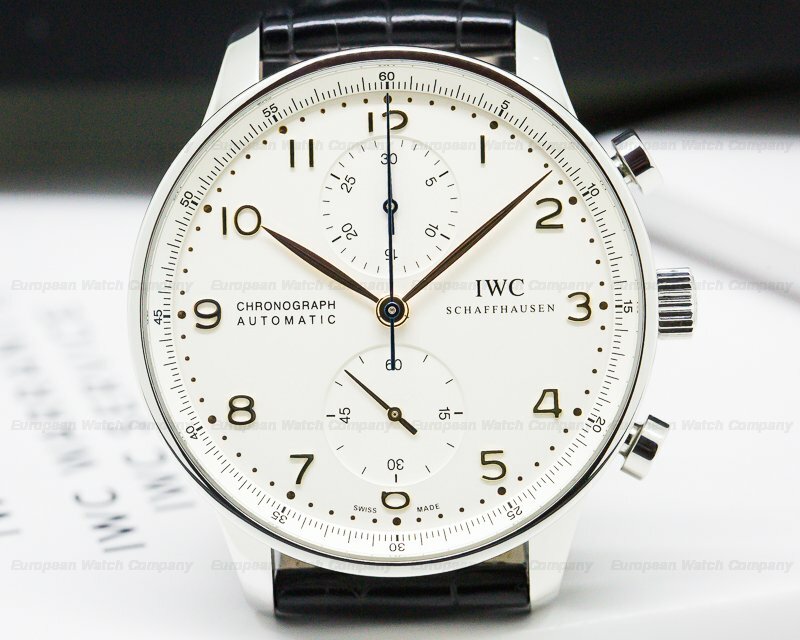 The 44mm diameter solid two-body case, gently curved lugs, and stepped bezel, are brushed. 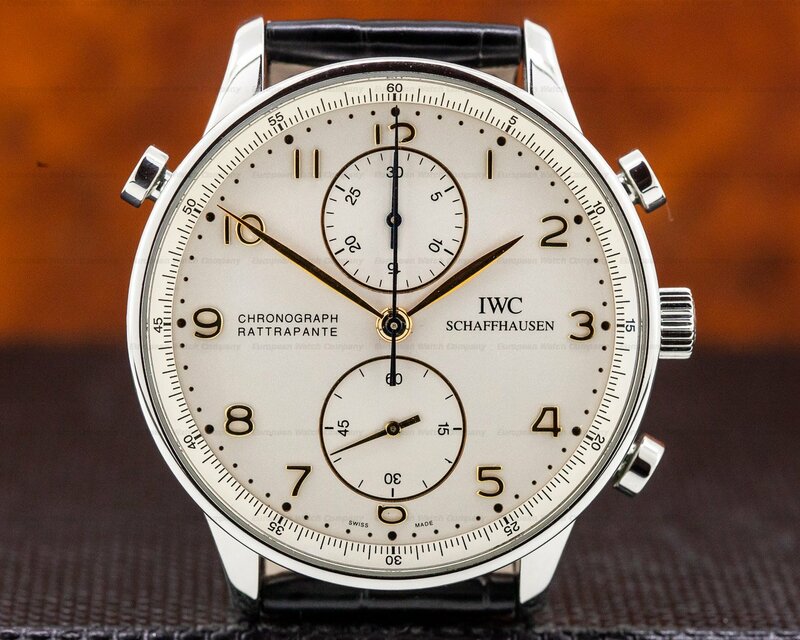 The dial is black with luminous white fat baton and triangular hour indices around a perimeter minute/second scale. 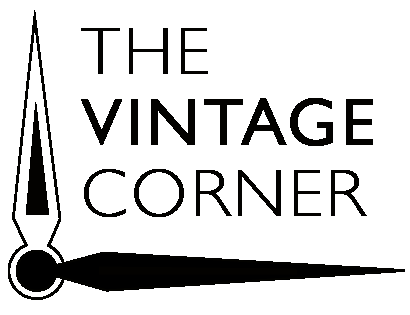 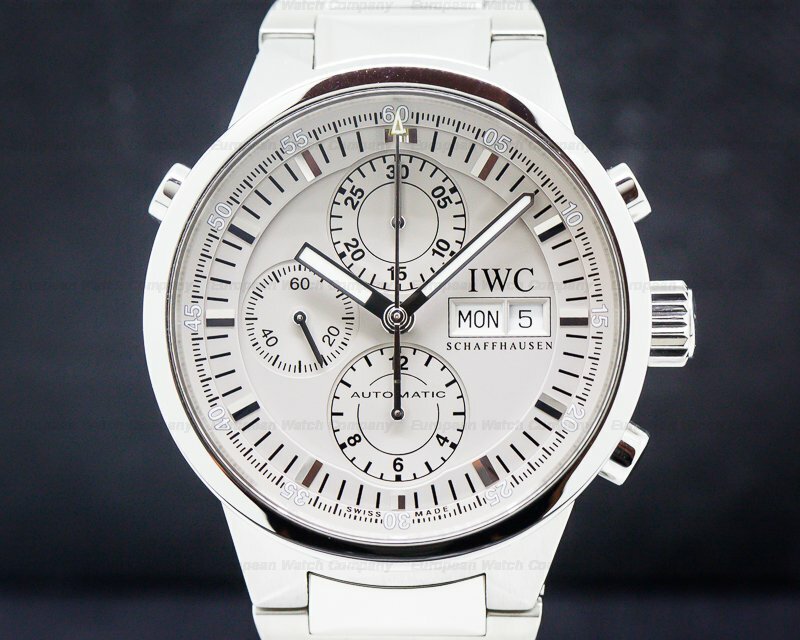 It has white luminous "spitfire" hands, a luminous center sweep chronograph second hand with a red jet plane counter balance, and there is a rectangular day aperture window with a vertical arched radial date window at the 3 o'clock position. 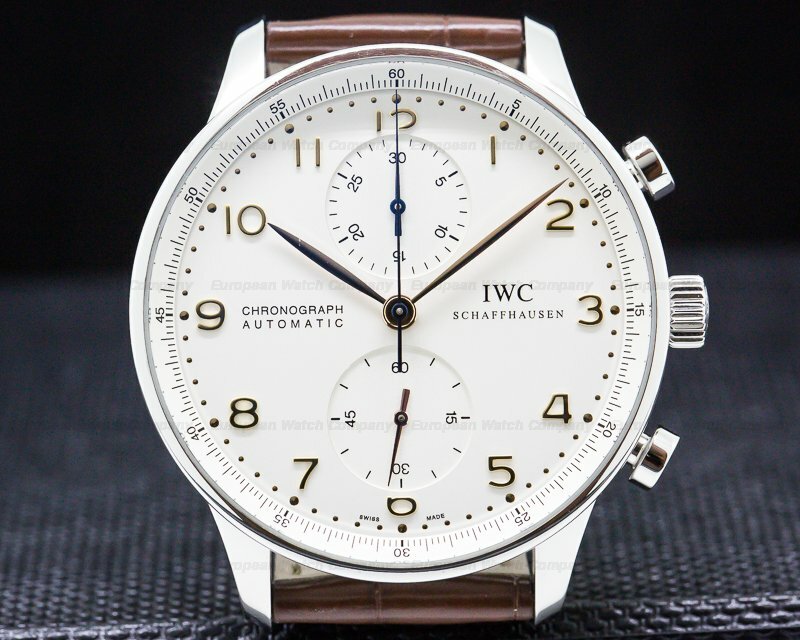 It has three recessed black subsidiary dials with luminous white Arabic numerals and markers, and luminous red/white indicator hands, including a running small seconds register at 9 o'clock, a 12-hour chronograph totalizer at 6 o'clock, and there is a 30-minute totalizer at 12 o'clock. 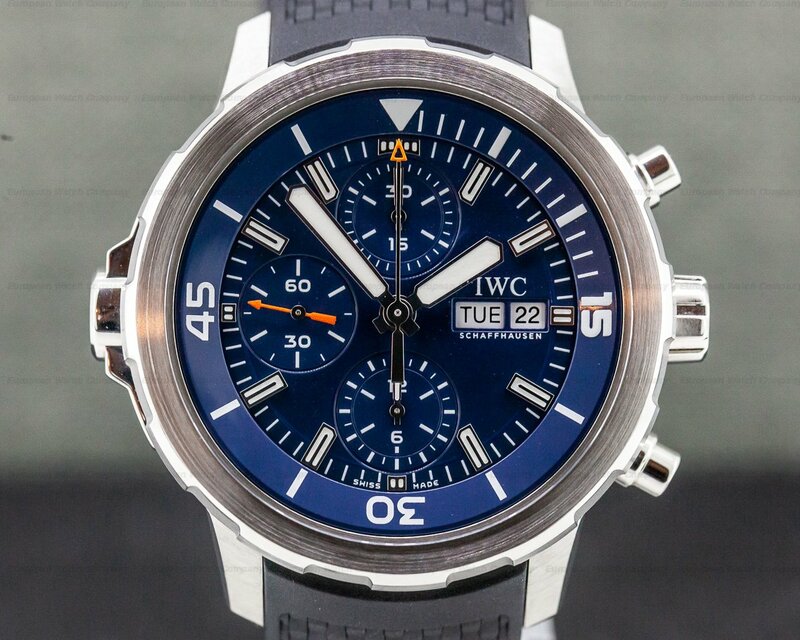 It has a 44-hour power reserve at full winding, and it's water resistant to 60 meters/200 feet. 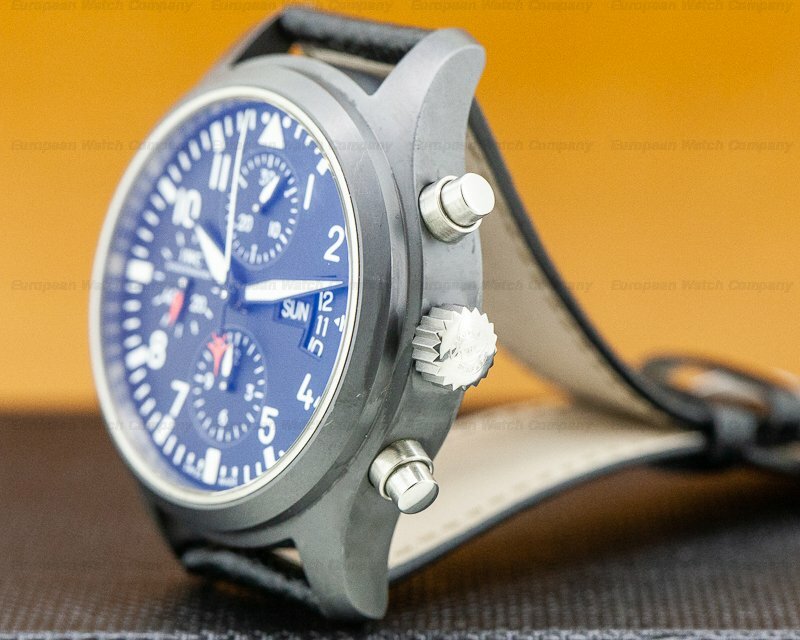 The 18mm thick case, dial, and movement are all signed. 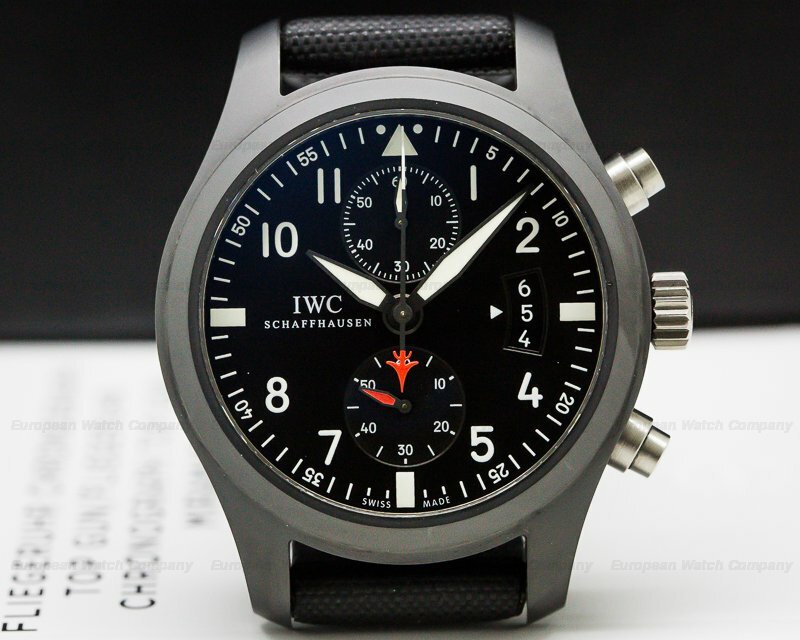 This IWC TOP GUN Chronograph IW378901 has a mechanical automatic self-winding IWC caliber 79320 (based on the ETA 7750) chronograph movement. 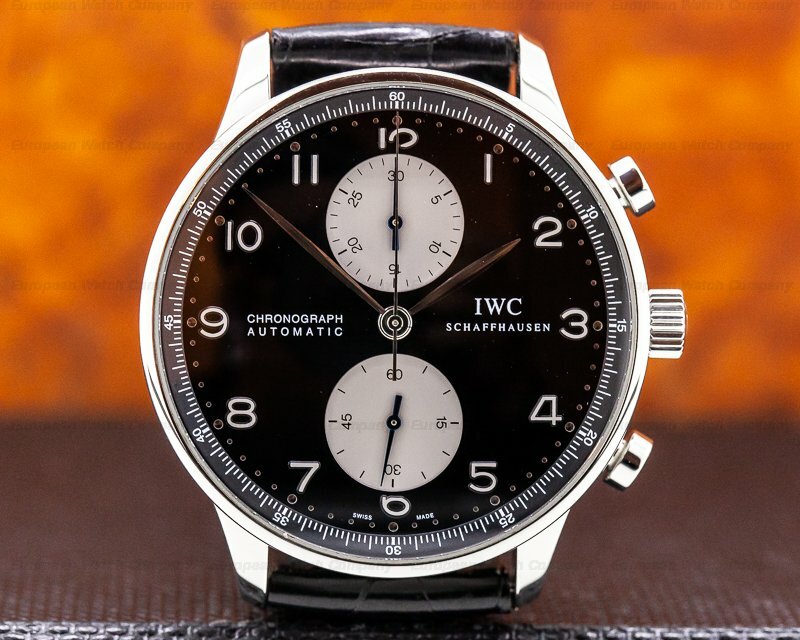 It's rhodium-plated, and it's constructed with 25 jewels, a straight-line lever escapement, a monometallic balance that's adjusted for temperature and 5 positions, and a self-compensating flat balance spring. 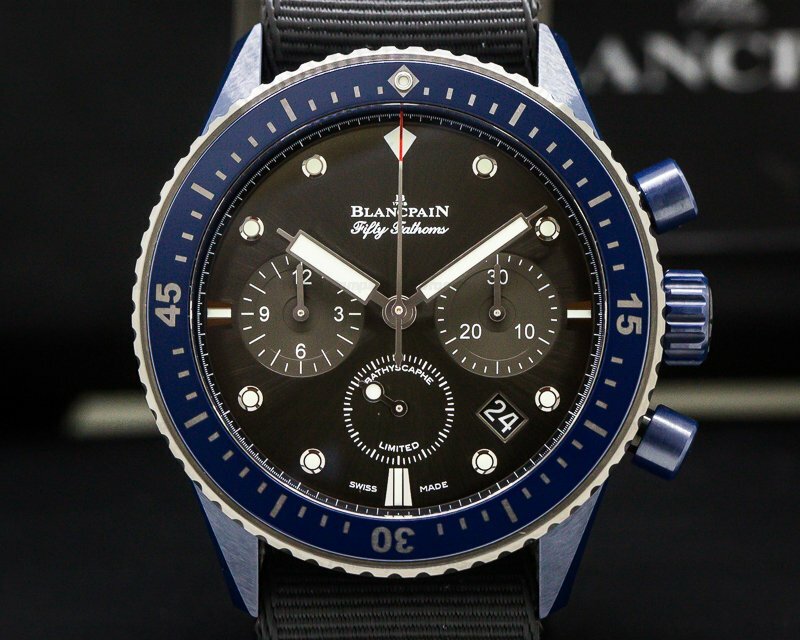 The movement is surrounded by a soft-iron inner case for protection against magnetic field, and it includes a shock absorber, an index regulator, and a hacking seconds mechanism for precision time setting. 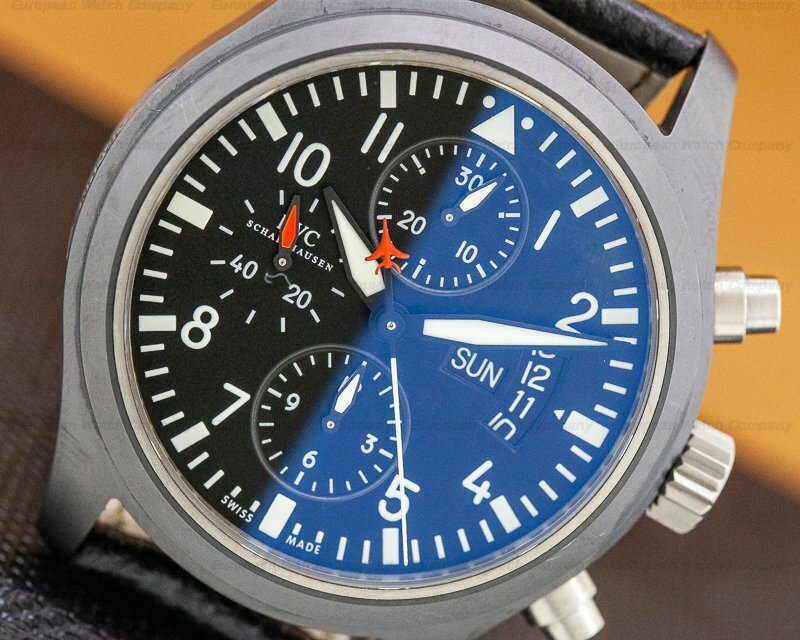 The rotor oscillates at a frequency of 28,800 vph (4 Hz). 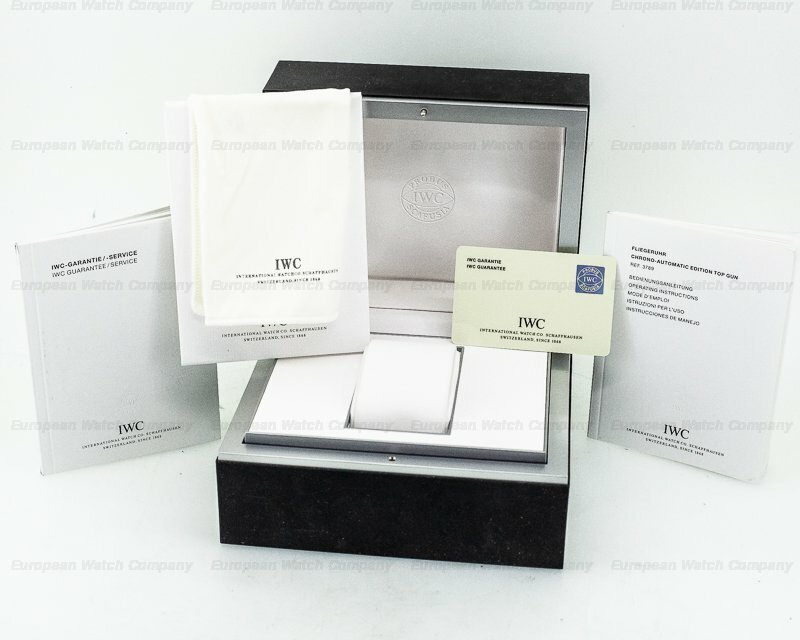 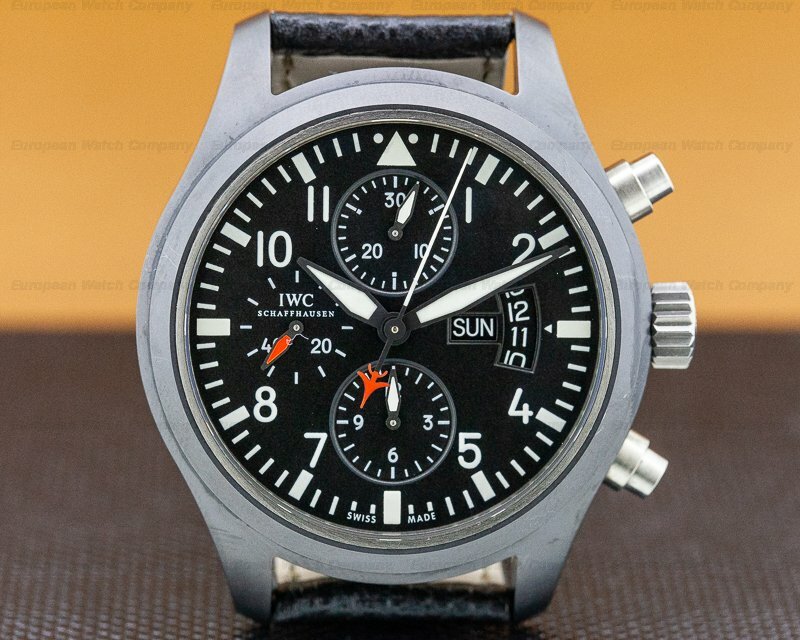 The IWC TOP GUN Chronograph IW378901 was introduced c. 2007.